First of all, the biggest change concerns the visual identity of the leagues. All leagues across the country going to have the same logo. And for once, the officials did not look to England. A role model adored so often in the past by the Thais. Instead, the league is making us a T for J. The new logo reminds of the Japanese J-League. And this is absolutely intentional. Since the J-League is considered a desirable role model under the new Thai FA by Somyot & Co. The, if you like mirrored J, represents the trunk of an elephant juggling a ball. There will be five leagues from 2017 onward and all bear the same name and are numbered consecutively. Just as is the case in Japan. However, the logos apply only for the first four tiers and they differ in colour. So Thai League (1) = red. Thai League 2 = blue, 3 = dark green and green is used by league 4. Grey is reserved for the enforcing company, the Thai League Co., LTD.
Another part of the reform is the introduction of a new third Division, which is going to replace the Regional League as Thailand's third tier. Thus, the former third tier is to become the new fourth tier. The new Thai League 3 will consist of two groups, upper (North) and lower (South). The champions of the two divisions earn direct promotion to League 2, while a third promotion place will be determined in a playoff match between the two runners-up. It is intended to carry out the two divisions of T3 with 16 teams each respectively. Under these conditions, the two bottom ranked teams are relegated to the new T4, the former Regional League. Right now we cannot say how the relegation scenario looks if less than 32 clubs compete, e.g. if teams could not meet the licence requirements like with the coming inaugural season. The Regional League itself will see no change and remains to consist of five divisions. And as in previous years, there will be a playoff round at the end of the season with 12 teams with the best four sides to get promoted. The amateur league forms the fifth League, which since 1996 has been a league system on its own consisting of the Khǒr Royal Cup (Cup ข. ), the Khor Royal Cup (Cup ค.) and the Ngor Royal Cup (ถ้วย ง.). These three Cup competitions are merged into one league now. And any (amateur) team which wants to play in the league can apply. However, there is no promotion and relegation. So in other words, no team from T4 can fall through the trapdoor. Possible, however, the officials kept themselves open a not well-known loophole for some tea money, as it was customary in the past. A notable reform in the T4 (Regional League) is still to mention. For the first time, reserve teams are allowed to enter the competition. The so-called "B teams", Spain is used as the role model here, are, however, not allowed to get promoted. The main aim is to give players above the under-20 level more match praxis. Because, and this is also part of the reform plan, youth leagues will be carried out in all age groups down to the under-14 level. With the upcoming season, even the foreign player rule changed slightly. At least for the 2nd tier. The rule changes from the previous 3 + 1 (meaning teams could field three foreigners plus a fourth player from an Asian country at any one time.) to a 3 + 1 + 1. The extra + 1 is for a player from Southeast Asia. But so far only three have clubs have made use it. BBCU FC with Hafiz Abu Sujad (Singapore), Krabi FC with Thierry Bin (Cambodia) and Reiner Maurer's Ang Tong with the ex-Nuremberg and Philippine international Mike Ott. From 2018, this regulation should also apply to Thailand's first tier. Besides the TV money, the League will distribute extra money, which the clubs can use to improve their infrastructure. The clubs, however, must, submit an application and are to demonstrate what and how they want to use this money. The amount is capped, but not infinite and staggered according to league affiliation. Up to the first tier, the number of participating teams per league should remain the same over the next years. Any possible and typical Thai football incidences left out of course. And so it is the plan of the league to reduce the number of teams in T1 down to 16 with the 2019 season. According to the officials, this should help to give more space for the national team to prepare for international matches and competitions. The meaning of Cup Reform is not about reforming the Cup competitions, but rather a reform of trophies to be awarded to the winners. With the introduction of the Thai Premier League, 1996, the old trophies were turned into dust catchers and banned to the amateur leagues. Only the now 100-year-old Kor Royal Cup (ถ้วย ก. 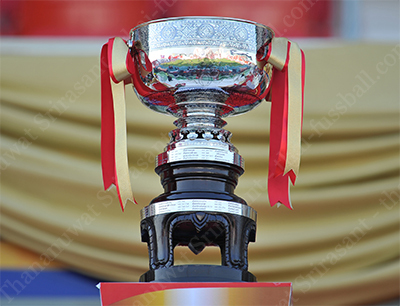 ), which was awarded to the Champion of the Thai League till 1996, has been used as the trophy for the winner of the match between the league champion and the Thai FA Cup winner till this year. According to our understanding, the old trophies will be transferred back to their old purpose, with the 2017 season. This means the so-called Kor Royal Cup (ถ้วย ก. ), as in the past before 1996, will be awarded to the champion of Thailand's top-flight. The Khǒr Royal Cup (ถ้วย ข.) to the winner of the second tier, the Khor Royal Cup (ถ้วย ค.) to the overall winner of the third and the Ngor Royal Cup (ถ้วย ง.) the overall winner of the fourth league. For the Thai Champions Cup Winner (Super Cup) a new trophy has been already forged. Of course, the here documented reforms should last through 2019. But you know never know in Thailand. And a new leadership in 2019/2020 could throw everything all over the pile again. Just for the sake, nothing reminds on the previous administration, or because something's wrong with the Ying and Yang, or the Feng Shui. Surely nothing one want to see. Rather it's consistency and a common identity, by creating a brand easy to be recognised, such as the J-League, should be the target. And obviously the association, under the leadership of Somyot Poompanmoung does a lot of things right and lays a foundation for the future of Thai football. Something that was long overdue after the ongoing stalemate during the years under Worawi. Therefore, we like to buy the T for a J.
Thailand to bid for the 2026 World Cup?